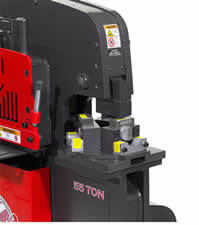 Angle notchers are specialized for the angle iron frame industry, although there are additional applications. 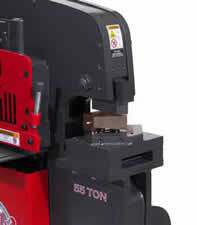 The Angle Notcher tooling takes a precise 92 degree notch from the bottom leg of angle up to 3" x 3" x 1/4" profiles. Coper/Notcher tooling, aka a nibbler, allows for a small bite or a large bite to be taken out of plate. 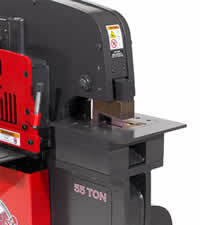 Pipe Notcher tooling quickly makes saddle joint connections in schedule-40 pipe. Turret Pipe Notcher Housing allows you to load your multiple pipe dies into the housing and then you can switch from one die size to the next.